Summary: Something’s Gotta Give has much to enjoy, but it is unlikely to merit an entrance into the pantheon of great romantic comedies. There is a 40-minute period in the middle of Something’s Gotta Give that shows director Nancy Meyers had the chance to make a really good and original romantic comedy. 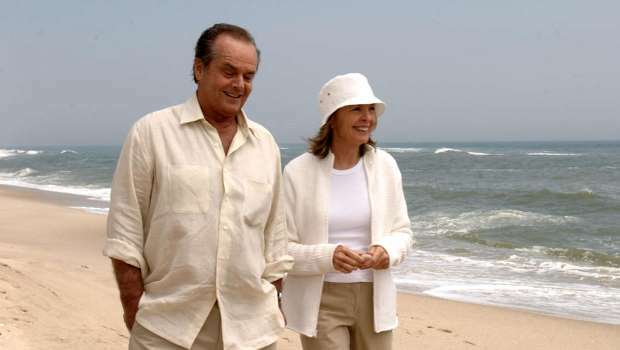 This ‘second act’, so to speak, which only features the film’s two main characters, Harry Sanborn (Jack Nicholson) and Erica Barry (Diane Keaton) as they get to know each other and fall in love, has everything a good romantic comedy needs: fine performances, a tight script, good pacing, a couple of amusing set-pieces and a whole lot of romance. However, this highlight of Something’s Gotta Give is compromised by the rest of the film, which has everything a good romantic comedy certainly does not need: dull performances from the likes of Amanda Peet and Keanu Reeves (who tries hard but is the acting equivalent of a metronome) and a script that doesn’t hit home either when it is trying to be funny or is trying to make a more serious point, all loosely-bound together by a flacid, overlong narrative that just doesn’t know when to stop. Which is a shame, because there is little doubt that in Something’s Gotta Give, Nancy Meyers is trying to do something a bit different. By concentrating on the burgeoning love affair between perennial bachelor and only-women-under-30-chasing Harry and sophisticated but slightly repressed playwright Erica, Meyers turns her attention to a group of people who do not feature strongly in today’s youth-oriented romantic comedies – middle-aged people. And, as the middle section of the film shows well, a love affair between two people over fifty can be just as enjoyably romantic as that between two young bucks. Harry’s change in direction from just going after women young enough to be his daughter begins when he is forced to spend time along with Erica in her exquisite Hampton’s beach house. After taking Erica’s daughter Marin (Peet) to the house for the weekend of nooky, unaware that Erica and her sister Zoe (a criminally underused Frances McDormand) are there as well, Harry suffers a heart attack. Taken to the hospital and looked after by the kindly doctor Julian Mercer (Keanu ‘tick tock’ Reeves), Harry is instructed not to go anywhere very far, and so is forced to be looked after by the disapproving Erica in her house. All this exposition is pretty dull, but things begin to hot up as Harry and Erica find themselves attracted to one another, both surprised by this turn up for the books. Up until this point Nicholson has essentially been faxing in his performance, and Keaton has been far too shrill for her own good. But when the two of them are alone together, their years of experience and pure talent begins to shine through, and Something’s Gotta Give takes a sweetly enjoyable turn. When Harry gets better and is allowed to leave, and the outside world creeps into the film once more, the movie starts becoming increasingly interminable. It is blindingly obvious to all and sundry that Harry loves Erica and that they will eventually get together. Of course part of the enjoyment of romantic comedies is in seeing a situation where two lovers are not together eventually resolve itself. But Meyers forgets that the excitement and satisfaction of resolution can slip into boredom if this resolution takes too long to arrive. In ‘Something’s Gotta Give’ it takes far, far too long. After Harry departs, the film is full of poor dialogue and meandering narrative and suffers from a lack of screen time shared by Nicholson and Keaton. Apart, the two actors suffer, as Nicholson gets lazy and Keaton becomes shrill once more. So when Harry and Erica do finally get together, the ability to enjoy what is unfurling has been considerably compromised. Something’s Gotta Give is saved by its second, central act, where Jack and Diane show their worth. They light up the screen and make you feel that you are watching a romantic comedy that almost reaches the dizzy heights of When Harry Met Sally. But then the two screen giants are separated, Meyers takes her eye of the ball and starts to believe that her film is funnier than it actually is. Meyers’ latest directorial outing should be congratulated for trying something a little different and it’s great to see Jack Nicholson and Diane Keaton share screen time. But the film is badly let down by its third act and could have done with shaving a good half an hour off its running time. Something’s Gotta Give has much to enjoy, but it is unlikely to merit an entrance into the pantheon of great romantic comedies.